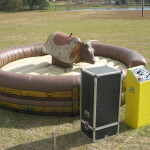 The Mechanical Bull is a single action game, which challenges your stamina, agility and reactions. 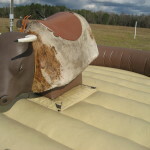 Safety is paramount, so our Mechanical Bull is fitted with a unique Automatic Stop Sensor. 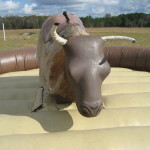 As soon as the rider falls, the bull stops instantly. 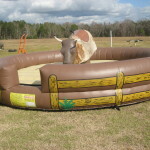 The Mechanical Bull is a fun game for the whole family and perfect for Fall Festivals and public events! 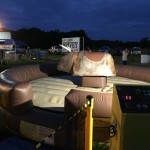 How To Reserve The Mechanical Bull! All rentals are subject to a Delivery fee, always depending on the location. Learn more about our delivery rates.